When it comes to exhaust work, the best option for a real collector car is a high-quality, rust-resistant stainless steel exhaust system that will last the life of the vehicle and pay for itself many times over the years. However, many people won't pay the up-front cost of a stainless steel system. Maybe they plan to fix the car as cheaply as possible and "flip" (re-sell) it quickly. 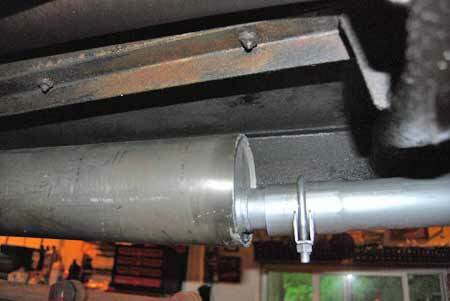 Exhaust pipe patches (section replacements) are not that hard to do. With a few tools and some elbow grease, one can cut, trim and install a replacement tailpipe section and avoid the cost of a new pipe or a whole new system. We have a 1954 MG TF roadster that's being "fixed up" as a low-bucks project car. We also have an MG TD that's getting a frame-up restoration. The TF had a banged up old exhaust system that needed replacing. The restored TD will get a new stainless steel exhaust system. We did not need the old exhaust parts that had been removed from it. They included a nice stainless steel muffler. The TD and the TF use an exhaust system. Our old TD system had a crack in the pipe just behind the muffler, but otherwise the engine pipe was solid and it had the stainless steel muffler that we bought on eBay. It also had a nice tubular type chrome-plated exhaust tip. We decided to replace an approximately 18-inch long section of the tailpipe where it had cracked. Welding a bracket on the pipe had caused this crack. Electrolysis from the welding process weakened the metal near the crack. The rest of the pipe was very solid. We decided to replace the bad section. This chain style pipe cutter is easy to use. You stretch the chain around the pipe and link it in place. Then squeeze handle together and rotate the tool. The pipe cutter tool has a chain with cutting discs that fits around different diameter pipes. The chain has pegs on it that hook into opening. Pick the opening that makes a snug loop around the pipe you want to cut. Believe it or not, as you rotate the tool back and forth, the discs will start cutting into the pipe. As the cut gets deeper, you will squeeze the "pliers" type handles to tighten the loop. Before long, the bad piece of pipe will be cut through and will drop off. These chain cutters are intended for use on exhaust tubing made of regular mild steel. However, we have used a good quality model to cut stainless steel and it worked fine. We cannot say if this will shorten the life of the tool. Next, you have to trim (and possibly shape) the replacement exhaust pipe section so you can install it in place of the bad section you cut out. The ideal type of connection is a slip joint at both ends. The slip joints from the replacement piece usually fit over the pipes being joined. Slip joints are formed by expanding the ends of the replacement pipe section. But in some cases, there may be no slip joints-just a straight pipe that slides over the pipes being joined. When you have a replacement pipe with one or two ends expanded to make slip joints, the advantage is that the narrower pipe cannot slide back in forth inside the larger diameter pipe. So if you are lucky enough to get a proper length replacement section with both ends already expanded, a good repair should be simple. If you have to widen (or expand) the replacement pipe at either or both ends, the job becomes just a little more difficult. An inexpensive hand tool can be used to slightly expand exhaust pipe made of conventional mild steel. The wider section of the tool has a shaping die held together with springs that you tap into the end of the exhaust pipe that's to be expanded. Once it sits tightly inside the pipe, a large wrench is used to rotate the shaft, which spreads the dies outward and hopefully expands the tubing. 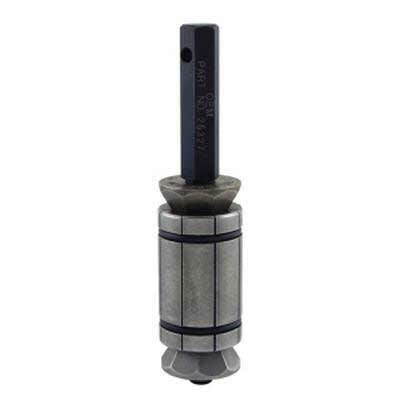 This manual exhaust pipe expander tool is readily available and comes in sizes to fit different diameter tubing. There are different sized tools of this type to fit inside different diameter exhaust pipes. This tool is actually made for shaping the end of the pipe nice and round, but the do-it-yourselfer can use the told to slightly expand the tubing. A more expensive version of the tool comes in a kit (about $175) that has several interchangeable shaping dies and a shaft designed to work with an air operated impact wrench. Neither D-I-Y tool is made for stainless steel exhaust pipes. 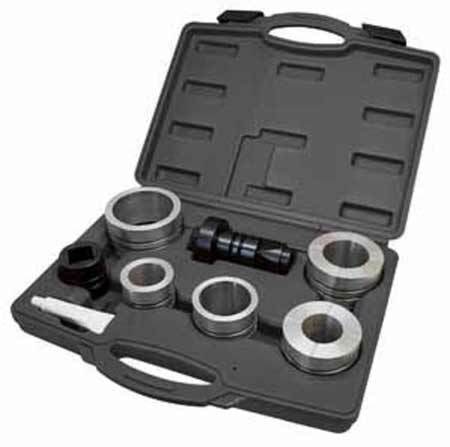 With this kit an impact wrench can stretch pipes. Collet sets expand pipes from 1-5/8 in. to 4-1/4 in. The pipe stretcher kit is a convenient, inexpensive alternative to hydraulic pipe expanders and has a molded storage case. A nice section repair can be made by using a repair section that is already expanded to a proper size slip joint on one end. The repair piece can be measured and then cut to the proper size to replace a damaged section. The expander tool can be used to slightly enlarge the diameter of the other side so it slips over the remaining good piece of exhaust tubing. Once you had tight slip joints formed front and rear, you can use the proper size U-shaped muffler clamps to cinch things up tightly to eliminate exhaust leaks and noise. 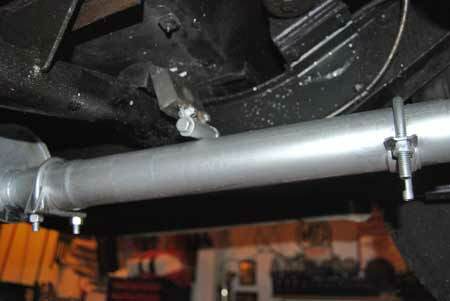 The good sections of the old exhaust tubing can be coated with heat curing exhaust paint. The pre-sized end of this repair section slipped over the muffler extension in front and was of a design that allowed used of the old hanger. A conventional U-shaped muffler clamp made for a tight joint at the muffler extension. What's called a "GM style" clamp with solid sides on the lower section will sometimes give you an even stronger joint. Your section repair is complete. It is good practice to recheck the integrity of the system a week or two later. Raise the car and look for any signs of leaking exhaust gases, such as a sooty spot near the joint. Re-tighten all fasteners tightly, but lightly. In other words, you want them snug, but remember that exhaust clamps are easy to snap if over-tightened.